Meet my new bicycle, Duke Muir. The story of how Duke Muir came to be is a fusion of three separate stories: Vowing to Get the Hell Out of Dodge, Applying for Lael's Scholarship, and Choosing the Hayduke. For thirty two days in December and January, I lived in a magical place. 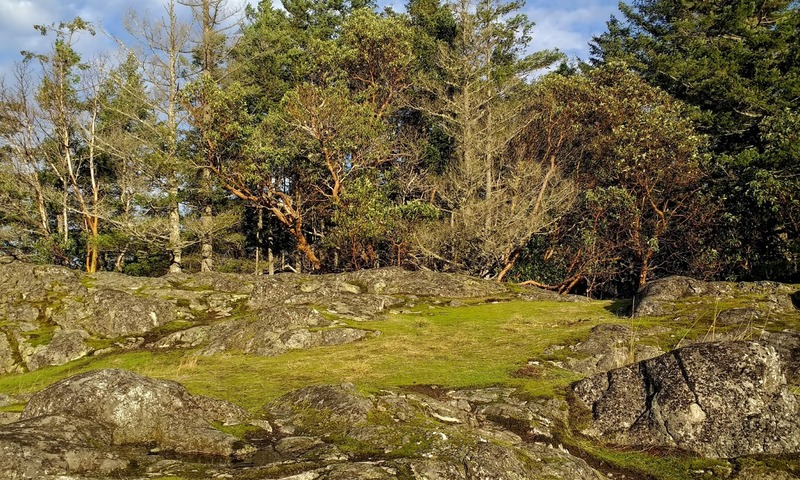 A place where arbutus and Garry oaks hold a steadfast stance on salty shores. A place where thick mossy rugs are like opium on hilltops, coaxing you to sit down for just a moment -- no, rather lie down for an entire afternoon snooze. A place where cormorants gather by the dozens to roost in treetops, noisily chattering as the sun sets. A place where time is measured only by the ferries that enter and leave the harbours. An eagle eye's view of the magical place, looking north from Reginald Hill. Mt Bruce (2,326 ft / 709 m) and Mt Maxwell (1,946 ft / 593 m). If I were to turn towards the south, I would see the San Juan Islands. begging for a picnic or a nose to be buried in a book. 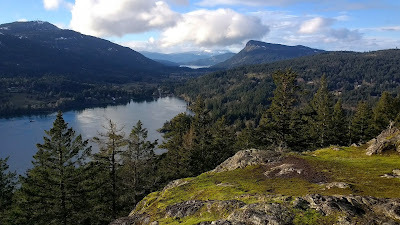 This magical place is Salt Spring Island. One of the southern Gulf Islands, Salt Spring is located in the Strait of Georgia, snuggled between mainland British Columbia and Vancouver Island. The Gulf Islands are close relatives to Washington state's San Juan Islands. They are separated only by an international border and distinguished by citizens who look the same but end their sentences with "eh." With 10,000 year-round residents, many of them "artist-types," Salt Spring is the most populous of the Gulf Islands. But it certainly doesn't feel that way; nature and solitude are abundant.